A couple of weeks ago, I received an adult education catalog from a local vocational technical high school in the mail. Now most people discard those kind of things as junk mail but not me. I immediately started looking through it to see what classes they were offering. Yup, total dork. Then low and behold, I spotted the perfect class - Whoopies and Wine! I immediately signed up and encouraged my friends to do the same. After ENDLESS snow (currently still snowing out my window) in our area and (another) two back to back snow days, last night's Wine and Whoopies couldn't have come fast enough! 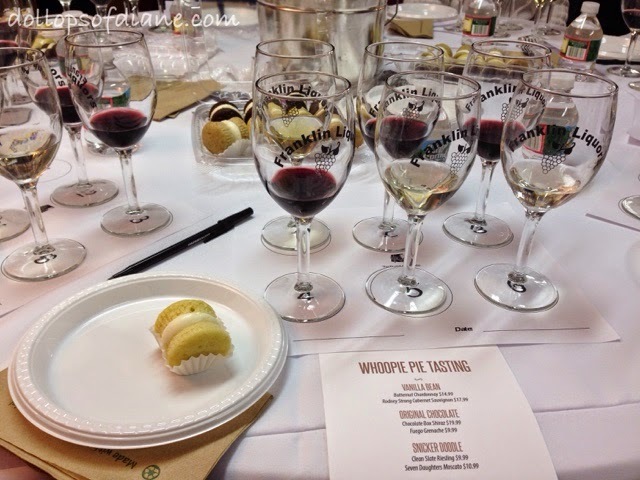 The event was hosted by Mark at Franklin Liquors along with Kerri of Making Whoopie. They led us through the tasting of three flavors of whoopie pies and 6 varieties of wine. We sampled (as in ate a lot of) the Vanilla Bean, Original Chocolate, and Snicker Doodle whoopie pies. All were good but I'd say my favorite was the Snicker Doodle with the Vanilla Bean coming in second. I'm not a huge chocolate fan so that's most likely why it comes in last in my book. I also enjoyed the wine (duh!) particularity though because I usually stick to whites so I like to try out different kinds of reds. As for the wines I'd pick the Butternut Chardonnay and the Rodney Strong Cabernet Sauvignon as my favorites. We also sampled a moscato that was too sweet for several of my friends which worked out in my favor since I drank theirs, too. Nothing is ever too sweet for me. Overall the night was a great time - dessert and drinks with friends along with picking up some knoweldge from our friendly and informative hosts. The best part? It was all in the name of adult education. Next time you get one of those course catalogs you might just want to take a peak inside. You never know what you might find! If you're interested in booze, baked good, or a combo of the two, go check out the Facebook pages of Franklin Liquors HERE and Making Whoopie HERE. How could a night like this ever be bad?